Meet Los Angeles Youth Network (LAYN) Volunteer and Mentor, Wes Siler. 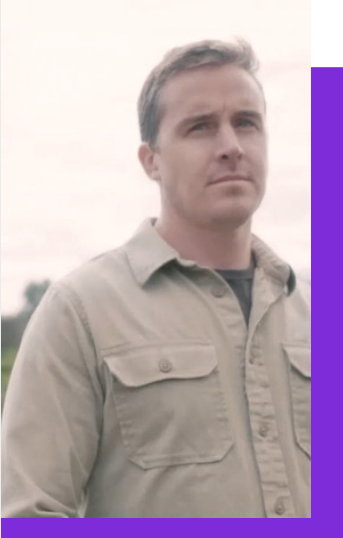 Wes is an avid outdoorsman, who loves sharing valuable life lessons through his adventures with his sidekick/dog, Wiley. 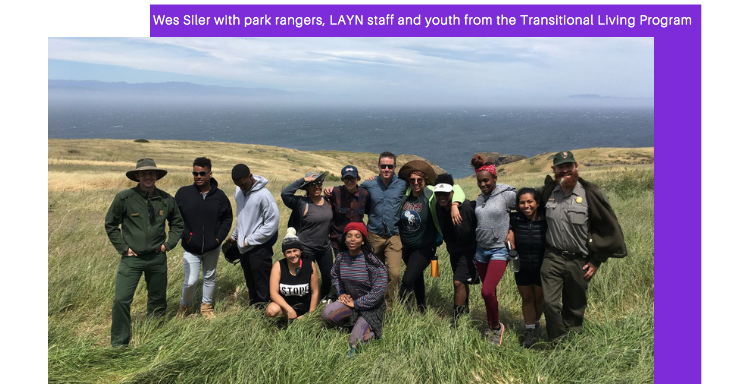 Two years ago, LAYN partnered with Wes, a contributor for Outside Magazine, on what we thought would be a one-time camping excursion for homeless and foster youth. Nearly three years later, Wes has become a fixture at the Transitional Living Program (TLP) --- mentoring youth one-on-one and hosting outdoor activities such as hiking, rock climbing and the annual camping trip. Through his dedication and consistency, Wes is helping youth gain both confidence and perspective beyond their current situations and teaching them the difference between living rough, "on the street," and enjoying the outdoors. "Teaching character-building activities like these --- and the new perspectives developed through them --- help put homeless and foster youth on a more equal footing as they work to build new lives and become successful adults," said Siler. 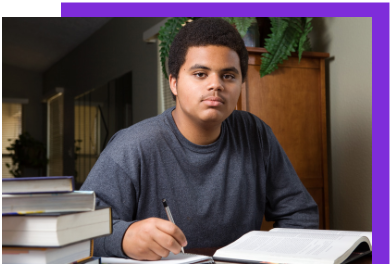 Youth who are at-risk of falling off track, but have a mentor, are 65 percent more likely to enroll in college. * They have a more positive outlook of themselves and their futures, and perform better in school, the workplace, and their communities. Each year, LAYN and Wes take 10-12 youth on a 3-day camping excursion. They receive a youth adventure kit, valued at $500, that includes all of the camping essentials. Youth spend a weekend with Wes and Wiley, learning about nature and volunteering. This experience is invaluable to them. "Through programs like this one, I'm helping new people gain an appreciation for our wild places, and hopefully that will help them support and vote for things like protecting our public lands, conserving our natural resources, and working to minimize the impacts of climate change. You won't vote or act to protect something if it has no value in your life," he added. There's more to the store. Find out what happened when Wes, "took a group of homeless youth on their first camping trip, here. And, "how he made a group of young people fall in love with the outdoors," here. "95 percent of young adults who had formal mentor relationships found these experiences to be 'very helpful.'" How about becoming a mentor? LAYN is always looking for individuals to provide group or one-on-one mentoring to youth, 12-24. Please contact the Development Department at development@layn.org for more information. Education and living-wage employment are often significant barriers for youth transitioning to independent living. In California, 65 percent of youth leaving foster care do so without a place to live and earn approximately $6,000 in a single year. * Consistent income is necessary, however the path to stability can often seem unattainable and confusing. The Los Angeles Youth Network’s Education and Enrichment Program provides critical services needed to assist youth with completing their education and securing employment. But, we don’t do it alone. 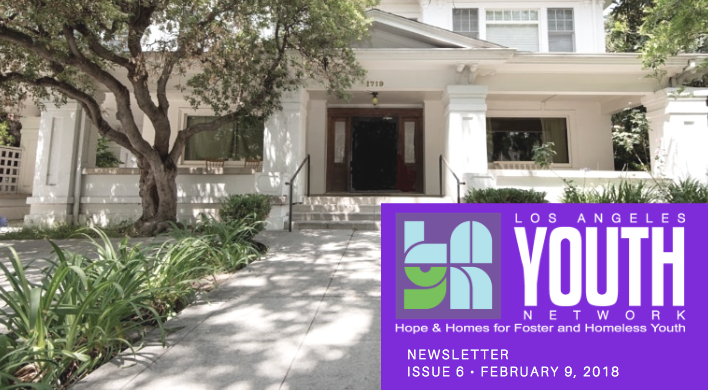 Thanks to long-time supporters like The Carl & Roberta Deutsch Foundation we are able to provide positive experiences that counteract the negative effects abuse, neglect, separation, and lack of permanency have on homeless and foster youth. The Foundation’s goal is to ‘improve the quality of life of present and future generations by funding programs that empower people to reach their fullest potential, strengthen communities, and promote the health of our society.’ They do this by inviting organizations like LAYN to apply for funding programs such as those that promote education and job development. Since 2009, LAYN has received support from Deutsch toward its Job Development program and participated as a member of the Foundation's Transition Age Youth Collaborative, which centers around a workforce development curriculum designed specifically for youth whose lives have been defined by trauma. Over the years, LAYN has provided job development workshops, one-on-one mentoring and career shadowing, in-house and community internships, and on-going education and employment support to hundreds of youth. Youth who have participated in LAYN’s Job Development Program have gone on to be successful employees who pursue careers of their choice, and community partners who now give back through offering opportunities for their peers. We’d like to sincerely thank The Carl & Roberta Deutsch Foundation for their on-going support and partnership. Together we are helping to empower tomorrow’s leaders. When Jordan came to the Los Angeles Youth Network, he faced a tremendous amount of obstacles on his journey to stability and healing. Lack of employment skills, minimal education, and self-esteem struggles from a childhood of abuse had left him homeless, hopeless and financially destitute. Just shy of his 19 th birthday, he made a promise to himself that this year would be different and began searching for someone that could help give him a hand up from his situation. He needed support and guidance and it was at that time he found LAYN’s Transitional Living Program (TLP). Upon intake, Jordan was provided with housing, mental health therapy, and supportive services. He then immediately connected with Arlene Aranda, LAYN’s Employment Specialist. Aranda helped Jordan map out a job development plan tailored specifically to his needs and interest. She also helped him identify his future goals and a budget that would allow him to start a savings account. Under the direction of Aranda, LAYN’s Job Development Program, helps youth identify and develop a career path to help build a successful future. The program was designed to give youth --- like Jordan --- the training, support, education and work experience they need to overcome the hurdles holding them back from self-sufficiency. Jordan had no previous work experience or internships; and, he was anxious about his ability to entering the job market. Thanks to LAYN’s partnerships with local businesses, Jordan was able to apply for and obtain a paid community internship to help facilitate his job-skill development. Jordan is now on his way to pursuing not just a job, but a career. He has discovered a passion for sports medicine and plans to enroll in community college and apply for an internship with a local sports therapy clinic. “I wasn’t sure I would ever be able to make enough to have a consistent place to sleep at night. With the support of LAYN, I now see that I cannot only get a job, but I can make a goal to have a career I love and am proud of,” said Jordan. Contact LAYN with available internship opportunities or entry-level job openings with your company. Volunteer to teach a skill-based class. Or, donate to support the funding for job necessities, like career clothing. For more information, contact the Development Department at (323) 467-8466 or development@layn.org .